Band: AM. Tube Lineup: 6D6, 6C6, 25L6, 25Z5. 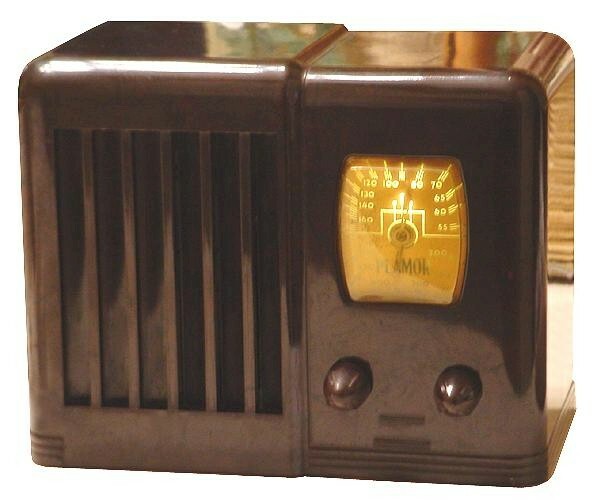 This little 4-tube Plamor radio was manufactured by Continental Radio and is often seen under the Admiral brand. The model is unknown, but the radio circuitry and tube layout matches the Riders schematics on the Continental model 5CU. The chassis is a simple 4-tube T.R.F. set. Unlike most sets where the dial is lighted from above, the dial on this Plamor is illuminated from behind.